The following article was printed in the Axedale Antics, May 2009 issue. Have you ever wondered how Axedale got it’s name? 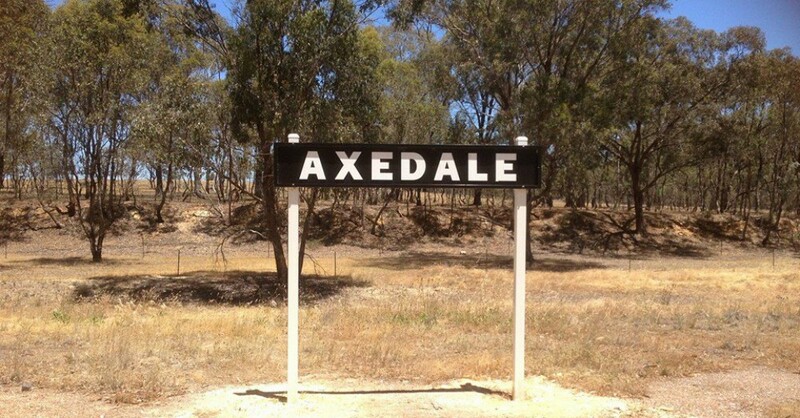 Situated where the McIvor Highway meets the Campaspe River, Axedale is believed to have taken it’s name from the old ‘Axe’ or ‘Axedale Station’, which was first licensed to A. Jennings and George Playne in 1840. It was taken out under licence number 64 of the Westernport Squatting District, for 67,000 acres. This was part of the original Campaspe Plains run and was estimated to carry 12,000 sheep. The run changed hands a number of times, until 1859, when the station came into the hands of Charles Vaughn and Edward Wild. Vaughn landed in Port Phillip in 1841, and was appointed inspector of markets in 1845. He was an accountant, financier and pastoralist, as well as being a Justice of the Peace and a member of the Legislative Council of Victoria from 1856 to 1864. In 1855, Patrick Drake built and operated the Campaspe Hotel – it remained a family business for many years. The ‘Victorian Gazetter’ of 1865, described Axedale as a postal township in the electoral district of Mandurang, under the control of the Strathfieldsaye Roads Board. There was a steam driven flour mill and a coach service to Sandhurst. There were seven hotels – Campaspe, Raglan, Perseverance, Shamrock, Union, Freemasons and Commercial. The township of Axedale was laid out shortly after the Crimean War and the Raglan Hotel took it’s name from Lord Raglan. Some of the streets perpetuate names associated with the war. Strathfieldsaye was the nations’s gift to the Duke of Wellington after Waterloo, according to ‘Accent on Axedale’ (1970), and many of the old official names have a Wellingtonian flavour.